Abstract: The rate of consanguinity, particularly first cousin marriages, is incredibly high in the Arab world. This has led to an uncommonly high burden of genetic disease in Arab countries. As the disease burden in many of these countries shift away from communicable diseases, the prevalence of genetic disease is becoming more significant. There are a number of ways of preventing and treating genetic disease. This paper explores these measures, and also the ethical and economic limitations to them. It proposes a strategic and cautious implementation strategy to manage genetic disease and optimize public health in the Arab world. As the disease burden in many Arab countries shifts from communicable diseases to more “Western” diseases, such as heart disease and genetic disorders, health care practices will have to change in order to meet the demand for treatment. In particular, the Arab world has a very high rate of consanguinity, particularly first cousin marriage, which leads to an unusually high rate of genetic disorders. Genetic disorders are often quite costly, and can be extremely disabling or even terminal. With decreasing rates of communicable diseases, such genetic disorders will become increasingly important, and it is a critical issue that the health care system needs to prepare for. As such, while preventative strategies should be put in place, given the limited resources in the Arab world, and the cultural and ethical implications of such preventative strategies, they should be implemented with selectivity and caution. 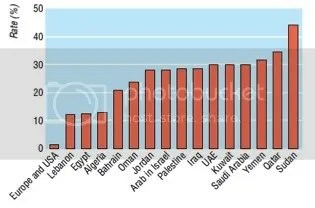 Although consanguinity is practiced in many places in the world, it is highest in the Arab region, ranging from about 30% of all marriages in most of the countries, to a high of around 45% in Sudan (Figure 1). This high rate of inter-family marriages has important implications for public health as the risk of passing an autosomal recessive genetic disorder (the most common type in Arab countries) to a child is increased with a higher degree of genetic similarity. When a disease is autosomal recessive, it means that a person must have two copies of the recessive allele – one from each parent – in order to show symptoms of the disorder. If, on the other hand, a person has only one recessive allele, and one dominant allele, then they do not actually have the disease. These people, who have one dominant and one recessive copy of the gene, are referred to as carriers, because they carry the genetic information for the disease. However, they can only pass it on to a child, if they produce children with a person who also has at least one recessive allele for the same disorder. When both parents have one dominant and one recessive allele for a gene, each child has a 25% of getting two dominant copies, a 50% chance of getting one dominant and one recessive, and a 25% of getting two recessive alleles, which in the case of a genetic disorder means disease. If two people were randomly selected to produce a child, their chance of both being carriers for the same disease is very rare, although it does occur. First cousins, though, have genes that are much more similar than two random people, so the chance of their both being carriers for a disease – particularly if their family has a history of that disease – is greatly increased. In theory, the link between consanguinity and genetic disease is very clear, and it turns out that in reality, consanguinity is demonstrated to lead to a higher incidence of genetic disease. In various studies comparing the genetic malformation rate among babies born to consanguineous couples as opposed to unrelated couples, babies born to related couples had a genetic malformation rate that was 2.5 times higher on average than babies born to related couples (Figure 2). More specific to the Arab world, according to a World Health Organization study, the Eastern Mediterranean is the region of the world with the highest rate of children affected by seriously detrimental genetic disorders, at a rate of greater than 65/1000 live births, compared to 52/1000 in Europe, North America and Australia (Hamamy and Bittles, 2009). 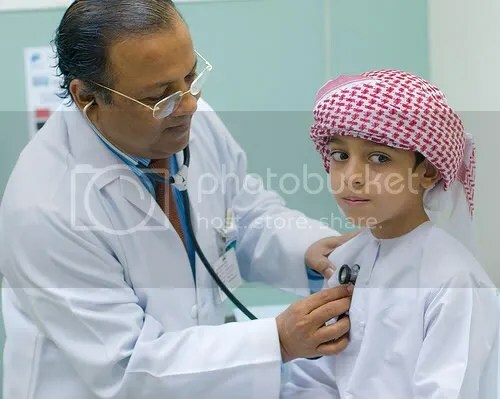 More specifically, one Saudi Arabia hospital reported that 19% of pediatric patients were due to congenital or hereditary defects (Meyer, 2005). Finally, many studies have found correlations between consanguinity and genetic diseases including hearing loss, infanto-youthful death rate, respiratory allergies, eczema, congenital heart defects, mental retardation, epilepsy, and diabetes, among others (Tadmouri, 2006). This greater burden of genetic disease has serious implications for the Arab world, particularly in regards to expense. While communicable diseases can generally be cured fairly easily and cheaply (with some obvious exceptions, HIV/AIDS being notable), non-communicable diseases, such as genetic disorders, tend to be chronic and difficult to treat, and sometimes even life threatening. Because of this, many genetic disorders can be very expensive to treat. To use as examples some of the more common disorders in the Arab region, β-thalassaemia costs on average $416,000/person over a lifetime or $7,000/person/year, and sickle cell disease costs $15,000/person including extra health care costs. Additionally, cystic fibrosis costs $9,400/person/year, and hemophilia costs $1000/person/year. This study estimated that the total cost of all of the most common genetic diseases in the entire Arab World would be about $13 billion per year. In the United Arab Emirates alone, the four diseases listed above would cost about $200 million per year (Tadmouri, 2006). In addition to the incredibly high health care costs, genetic disorders can have other negative impacts on Arab society. For example, many of these diseases are mentally or physically disabling, and some are even terminal, which both decreases the productivity of the future labor force and requires the government provide more resources such as special education services. Besides economic considerations, some of these diseases have a very detrimental effect on the person’s and their family’s emotional well being. With diseases like cystic fibrosis, people have to be prepared to die by around age 30 (and often earlier), and with diseases like hemophilia, people must constantly depend on medical visits to remain healthy. Above all, the physical and emotional difficulty of having or raising a child with certain genetic diseases can be very extreme. Because of the many deleterious effects of genetic diseases, and because they are starting to be a significant portion of the disease burden in certain Arab countries, effective preventative strategies ought to be designed and implemented. Perhaps the most obvious reaction to this problem would be to simply ban consanguineous marriages, and thus greatly reduce the risk of future children born with genetic disorders. It is unclear from the literature on genetic disease in the Arab world whether or not this strategy has been pursued in any of the Arab countries, although there is not any indication that it has. The government may indeed have a role to play in decreasing the genetic disease burden, and as will be discussed later, some countries have implemented mandatory preventative policies. However, banning consanguineous marriages does not seem to be an ideal solution for a number of reasons. First, it may be unlikely that such a ban would actually decrease the rate of genetic disorders significantly, particularly in rural parts of the countries. Given the geographic isolation of some populations, and the tribal nature of Arab culture, endogamy, or the practice of marrying within one’s racial or ethnic group, is also quite common. Given the fact that some populations descended from a small number of ancestors, certain diseases are likely to exist in a very high frequency within those populations, thus unrelated couples may be nearly as likely as related couples to pass on a disease to their child. Furthermore, the cultural reasons for consanguinity need to be addressed before a ban on such a relationship can be considered. It is important to note that consanguinity is not a strictly Islamic phenomenon as many may assume. Islam actually encourages its followers to marry outside of their family, and people of other religious groups in the Arab world also engage in consanguineous relationships, although at a slightly lower rate (Bittles and Hamamy, 2010). Rather, the trend towards consanguinity seems generally to be more culturally, historically, and economically motivated. Some of the reasons often given for consanguineous relationships include preservation of property, ease of marriage arrangements, and perceived compatibility between the bride and the groom, and also between the bride and groom’s family (Bittles and Hamamy, 2010). These last two points may be particularly important, as there is even a saying in Arabic expressing that sentiment. ← IMPLICATIONS OF THE CANADIAN HEALTH CARE SYSTEM FOR THE U.S.